Beemgee is software dedicated to helping authors and storytellers develop narrative material – from the idea to a fully formed well-rounded story. Because only when the author has complete control of the material is there a chance of emotionally engaging the audience. 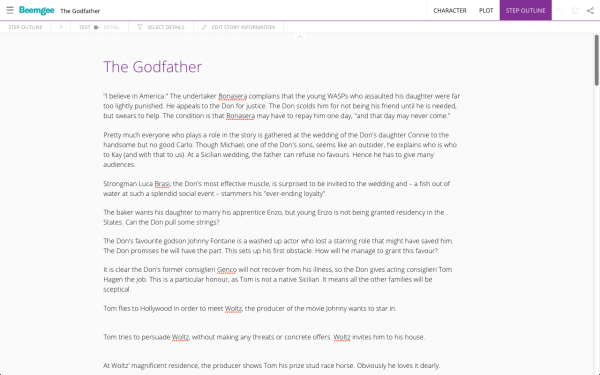 The Beemgee author tool works in your browser (even offline) and helps you outline your plot and work out the dramatic function of the characters in the story. The web-app is divided into a suite of three interconnected tools all accessible in each project, whether FREE or PREMIUM. You can also add structure markers to the narrative timeline, defining the type of marker (for example act or chapter breaks) yourself. In the attribute modus, you can even create new or overwrite existing tags if you prefer your own terminology or want to check your story against paradigms like the hero’s journey or Save The Cat. 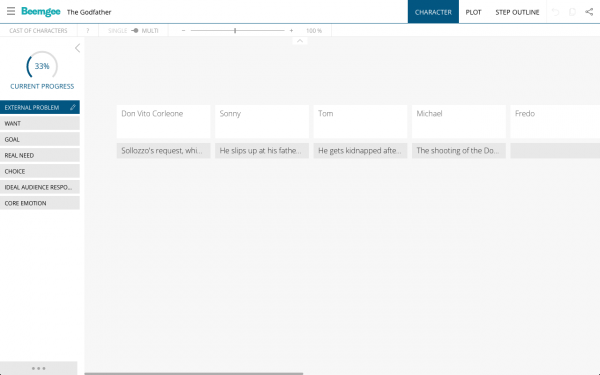 Adding all this information to each scene card means that you can highlight and filter according to any of your inputs, including any combination, for instance to FILTER the cards that feature a particular character or to show a particular storyline. Using the HIGHLIGHT function, you can then see the distribution of for instance motifs, storylines or characters in the overall narrative. Individual character questions in single view. See, save or print the complete character sheet in the PREMIUM feature DETAIL VIEW. The character sheets are your best guides when composing the plot. 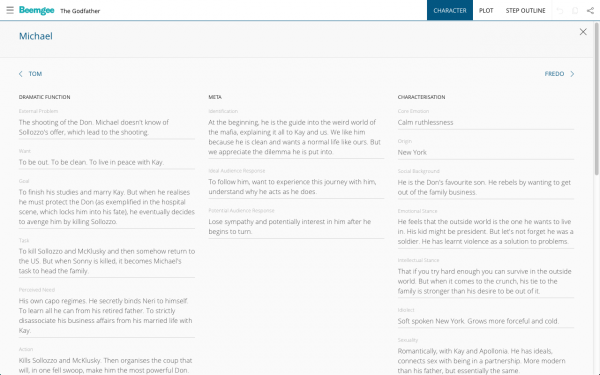 Compare and edit your answers in the COMPARE view per character attribute in order to heighten the contrast between the characters, which is a great way of finding and increasing conflict in your story. As you know, every story thrives on conflict. 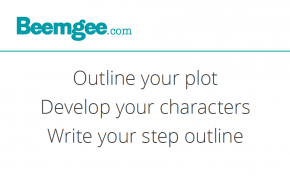 The STEP OUTLINE feature is designed to give you a complete textual breakdown of your plot. It shows you the DESCRIPTION texts for each plot event card in the narrative order. This is a fantastic basis for your treatment and pitch. The Detail View allows you to see the plot attributes you inputted in the PLOT section. Furthermore, STORY INFORMATION questions help you nail some of the most important points for your pitch, from the story’s theme to its logline. Discreet in-app dramaturgical advice at every stage of the outlining process helps you see and understand your story in new depth and detail. Just click the | ? | button. Pre-writing or re-writing – Beemgee is a tool for “plotters” and “pantsers”. Some authors use Beemgee to plan their work before writing, others to get their story drafts into shape. Whatever kind of writer you are, Beemgee can help you make your story emotionally more engaging. The standard functions of our storytelling tools are free. While you don’t need to register to TRY THE TOOL, we recommend that you sign up for a FREE account. This way any project you create is clearly linked to your account. PREMIUM character questions, for example on archetypes, the relationship status with other characters, change, dimensions, etc. DETAIL VIEWS of characters and plot events. 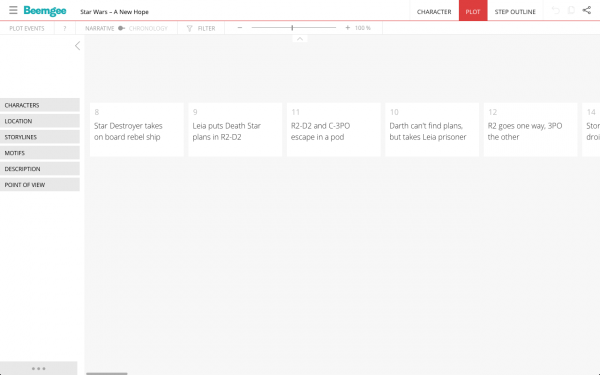 DETAIL VIEW of your step outline, including any and all plot information you have attributed to your events. STORY questions, concerning for example your theme, central conflict and the logline. Export PDFs of your character sheets, the plot, the step outline, or the entire project. Export a treatment or your story or a manuscript document as RTF text file. >> Sign up to PREMIUM. We are continually updating the tool, adding functions and improving usability. Since the tool works in your browser, you don’t need to install any updates in order to benefit from them. The tool is always up to date. See the full list of features here. Or read about the software’s functions and features.